Nintendo has revealed it will offer a Super Mario Maker Wii U bundle when the game releases, but it'll be only available to purchase at Walmart in the US and Canada. Nintendo has revealed a Super Mario Maker Wii U bundle will be available exclusively at Walmart in the US on September 11, the same day the standalone game will go on sale. The bundle will include a Wii U with 32GB of internal storage, a download voucher for Super Mario Maker, a Super Mario Maker Idea Book, and the 30th Anniversary 8-bit Modern Mario amiibo. The Wii U bundle will retail for $299.96. This isn’t the first time Nintendo has partnered with Walmart to offer exclusive physical goods for sale at the popular retailer. Earlier this year, Nintendo partnered with Walmart to offer the Super Mario amiibo - Gold Edition as an exclusive. 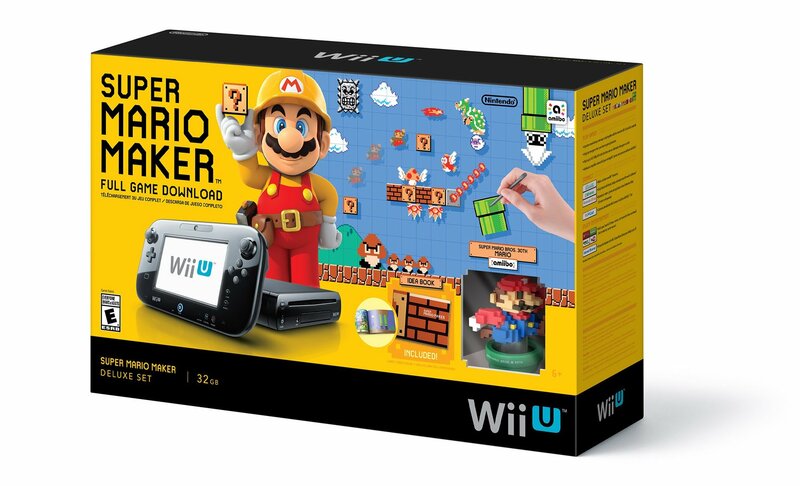 We’re sure considering how popular Super Mario Maker has become prior to its release, this Wii U bundle will sell well for those who have been looking for a reason to pick up Nintendo’s console. Can I get that without the Wii U? Dammit. Sure!! For $200 on eBay the day it comes out! I already have a Wii U I just want the bundle minus the (what would be for me) redundant console. Now Sept 11 can be known as Mario Maker day! Yayayay! Even with the game 300 dollars sounds like too much for a WiiU. Hmm. I think I may need to get a WiiU for the kids, should I get the Splatoon Bundle, MM Bundle or just a refurb? It gets so much more use than ps4. Just FYI for Amazon Prime members, there is a prime discount on Mario Maker. Its $47 after you add it to your cart. Normally $59. Oh shoot I might have had some other coupon credit for an additional $5. Looks like without that the price should be $52 with a prime discount of $9.89. You have to add it to cart and them proceed to checkout to see the price difference. Ah I didn't go to checkout, how are you supposed to know if something has Prime savings? There should be a little "Save with Prime" advertisement on the product page right under the shipping date. Oh that explains it, I missed it in the middle of all the other junk Amazon puts on the page. So were you able to get the $47 price or the $52 price? I went back to test it and my price is $52 now but I see other people saying they see $47. So maybe you get a single use coupon worth $5 as well? Oh ok, close enough. I'm glad that wasn’t just me. +1. Thanks for the heads up!